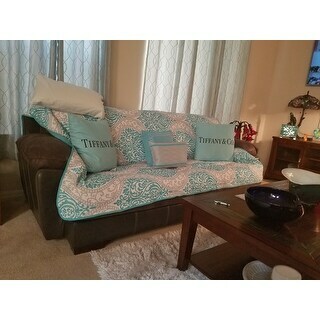 i love the color i bought for a couch cover im a tiffany lover so it matched my living room perfect so pretty. My niece wants me to find her one of the same brand. 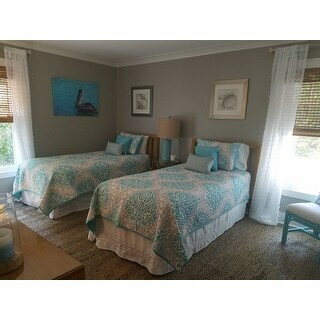 Make a statement in your bedroom with Intelligent Design's Lilly Coverlet Set. Flaunting a large damask print, this beautiful coverlet creates a soft contrast with a gorgeous aqua and grey color palette. The matching sham echoes the elegant pattern seen on top of the bed, while a solid flange provides a finishing touch. Machine washable for easy care, this chic coverlet set is made from ultra-soft microfiber for long-lasting comfort and style. Coordinating decorative pillows feature intricately embroidered details to complete this captivating look. I absolutely love this coverlet set! Colors are beautiful, the stitching is Hugh quality and the weight is perfect. I highly recommend this item! This set is beautiful. Very well made and it makes my granddaughter’s bedroom look Gorgeous! The colors are turquoise, light grey and white. 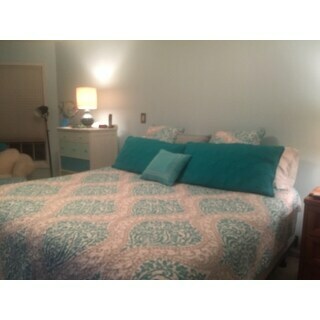 It fits the bed very nicely and the 2 decorative pillows are very pretty. well made, colors are bright & lighten up a room. Very happy with this coverlet set. This coverlet is perfect! The colors and pattern are exactly what I wanted. The material and weight are perfect for summer or winter! A year later, and it's still in like new condition, washes up easily! I HIGHLY recommend! I Absolutely LOVE this Coverlet Set! This set is the perfect colors I was looking for. The color is pretty much as it appears in the picture online, it might be just a little darker, the blue and gray, but not by much. It is lightweight and is just the right thickness that I can keep my heating blanket on underneath and my husband doesn't get hot when I need a little warmth on my side. It fits inside a standard washing machine and washes very well. I have had it a while now and it shows no sign of fading or any wearing. It looks just like it did when I received it. It makes my room look nice and light without being too feminine. I highly recommend this to anyone. Just as I hoped they would be. This has been one of the best and most reasonable purchases I've made in the past few months. The colors are amazing and match my guest room to a perfection. I had guest for the Thanksgiving holiday and purchased this item and requested the delivery be rushed. It arrived in time for me to give the sheet set an initial wash and the fabric held up and feels amazing. I've washed the set several times now and it still feels amazing and the color remained true. I would definitely purchase this brand again. We bought this set for our Airbnb. We love it. Our guests love it. Everything stays looking new with frequent washings. High quality. Great price. Can't beat that winning combo. Highly recommend. Absolutely love this set for my teen daughters room. The colors are just what she wanted and the quilt is soft. Another plus is that it is very easy to clean. I would buy this again! Beautiful colors and has held up in teens room! Very pretty and looks great after washing several times. "How big is this coverlet compared to others? Do I need to size up? " "How soft is this quilt? Some quilts are a little thicker and stiff, and some of them are very very soft to wrap yourself in. Where does this one stand?" Hello PinkLemonade, this looks to be more stiff but I'm sure after you wash it a few times it would be very soft. That's how most coverlets will be. Have a great day! because i thought it was super cute. Hello annalee, a coverlet is a lightweight, non-reversible bedspread that is usually either quilted or woven. Classically designed as a decorative layer to go over thicker bedspreads, coverlets often have a thin layer of batting, making them appropriate for use as a stand-alone bed covering, depending on the weight. Thank you for shopping with us.